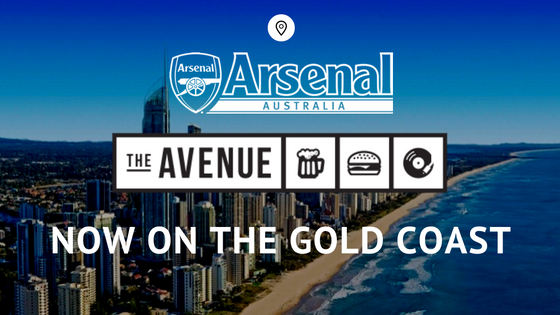 We are pleased to announce that Arsenal Australia now has a new venue on the Gold Coast! Get on down to our official Arsenal venue on the Gold Coast, the “New” Avenue in Orchid Avenue, Surfers Paradise. There are 2 bars, licensed to 3am in accordance with Queensland’s liquor laws, as well as a restaurant which serves food until after midnight. And of course, free entry 7 nights a week. The owners and management have agreed to supply us with our own area with 2 HD screens and full commentary. So come along and cheer on the mighty Arsenal as we fight to secure the 2016/17 EPL title. The owner and manager does not currently support a football team, so with your support, I am sure we can make them both Gooners for life! COYG! Please contact your QLD Rep Liam at brisbane@arsenalaustralia.com.au for more details, or find him and other QLD Gooners on their Facebook Page!